After the consumers have been struggling since April 2015, under the initiative of the Consumer Council, good news have finally come to the consumers: the taxi fares have been reduced. Beginning in November 3, the initial state of the taximeter (starting fare) will be 11 shekels and in Eilat, the initial state of the taximeter will stand at 9.40 NIS. In the other fares (up to a segment of 15 km, ordering a taxi, luggage transportation, etc.) the rates will not be changed. As it may be seen in the following tables, this is a reduction of 1.30 NIS from the fares in June 2013, representing a ten percent reduction. The reduction in taxi fares is an initiative of the Consumer Council. In April 2015, the Consumer Council CEO sent a letter to the Pricing Supervisor at the Ministry of Transport, Mrs. Daphne Ein Dor, and asked her to re-examine the components of taxi fares and the way they are calculated so that the fare for consumers reflect the drop in diesel prices. In August 2015, the Consumer Council found out that the Ministry of Transport does not reduce the prices, partly due to the fear that it will not be able to force taxi drivers to reduce the fares. Moreover, the Council found that in order to calculate taxi fares for consumers, the Minister checks the costs for the taxi owners and to do so, it uses diesel price lists presented to the Prices Committee, in which the price of fuel is much higher that the price the taxi drivers pay in reality - when they refuel in the stations pumps. An economic analysis conducted by the Council has revealed that if a calculation has been carried out, as required, according to the price of diesel actually paid for by the drivers in the stations, it would have been possible to reduce the fare to the consumer by 8%. 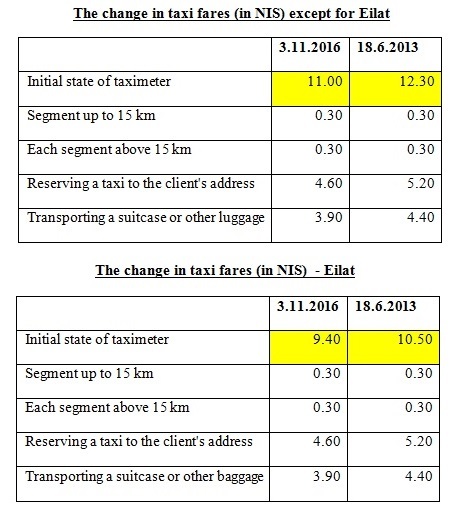 Based on calculation made by the Council and based on the findings of the Central Bureau of Statistics, it appears that updating the fare might save about 28 million NIS a year to the people using taxicabs.